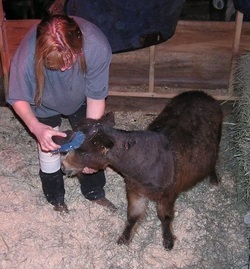 DaBubbles is a 5 month old miniature receiving care at the Chilly Pepper - Miracle Mustang, Equine Rescue & More stable. 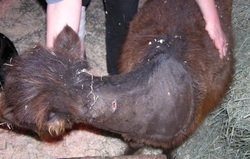 He had been receiving care for an eye wound when he was viciously attacked by a mountain lion. Currently he is recovering in the company of his friends Patches, Honey Bandit and Palomino. It was Friday, November 12, 2010. Another day I will never forget. It started out pretty normal. My girlfriend came back from her trip and came to see the mom and baby mini that i was taking care of for her. DaBubbles is a darling, approximately 5 month old miniature. 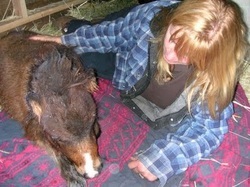 His mommy was staying here with him while I treated an eye injury he had gotten. It was a beautiful, warm day and I wanted the little guys to get a chance to run and play in the sun as they had been cooped up due to bad weather. I remember her laughing and telling me we should keep the baby for the equine therapy to go with the other miniature we had. I told her Matt wasn't really ready for another critter until we place some of the ones we have that need homes. So she said she was going to come and pick up the "momma' the next day, as I was going to keep treating Dabubbles' eye injury. (I am pretty much home 24/7 taking care of Honey Bandit so it worked out well for both of us). I left DaBubbles, his momma, and our other miniature Patches out playing and running in the big corral. Every so often I would check on them, as our four dogs were also out playing with them. I wasn't particularly worried about anything happening as the dogs always play with the mini and I was nearby. It felt so good to see them frolicking in the sunshine. After checking on "the kids", DaBubbles was lying down taking a nap and Patches and the mare were eating leaves and just relaxing, i went in the house for a drink. All of a sudden I heard the big horses crash against the panels and rushed out to see what was wrong. My stomach dropped and it hurt to breathe as I saw DaBubbles lying on the ground, his mom standing over him. My heart dropped as I hurried over to him. I was afraid he was dead. Our black German shepherd was hiding behind the big water tank, shaking like a leaf. I got down beside him and gently examined his wounds. I could see blood, but not a lot. But then my stomach turned as I moved his mane out of the way. He looked like someone had taken a butcher knife to him. He had two huge gashes about 3 inches apart and at least 3 inches long. They were so deep. I closed my eyes and held him as a wave of nausea passed over. I left him there and ran (or limped as fast as I could) and called Matt. Get home now, the baby was attacked and he looks like he is dying. He was hyperventilating and then he would almost stop breathing. HIs gums were gray and he was sin shock. After what seemed like an eternity, Matt and the boys got home. Like clockwork, one opened the gate while Matt backed up the suburban and the other grabbed a blanket for DaBubbles to lay on. I climbed in back and we were off to the vet. By now, DaBubbles realized he had left his mom behind and became more awake. He was whinnying and didn't want to lay down in the car. I think this was a good thing as his adrenalin kicked in and his gums became more pink and he looked alive again. At the vet, the first thing out of the vet tech's mouth was, this looks like a cat. 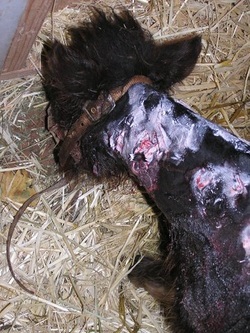 They proceeded to shave both sides and the top of his neck to uncover all the wounds. 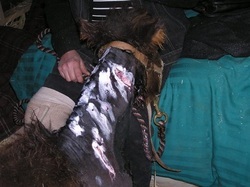 He had 3 knife like wounds that were so so deep and just gaping open. Boy did you have to breathe deep looking at those injuries. They were simply horrific. The vet thought that probably the cat's fourth tooth had hit the halter, which possibly saved the baby's life. 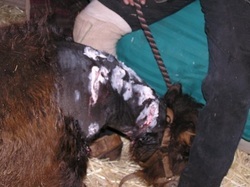 He had gashes everywhere and tons of scratch marks. After the baby was cleaned up, received medication, and we got instructions for treatment, we headed home. So now we are spending the days loving on DaBubbles, flushing and cleaning his wounds and giving him his meds. He is doing okay, but it sure doesn't look very comfortable. At night he comes to my bed and rubs his neck against me. 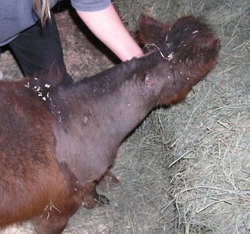 I know he is itchy, but it is so slimy and gross from all the medicine and the drainage. But he is so so sweet and has been through so much, you can't really blame him. Will keep you updated as his condition improves. There is also a Before and After collage below, the before pics are graphic but it helps you understand how much love and care DaBubbles and his equine, canine and feline friends alike are receiving.